Shotwell Street was one of the first graded and paved streets in the Mission District. 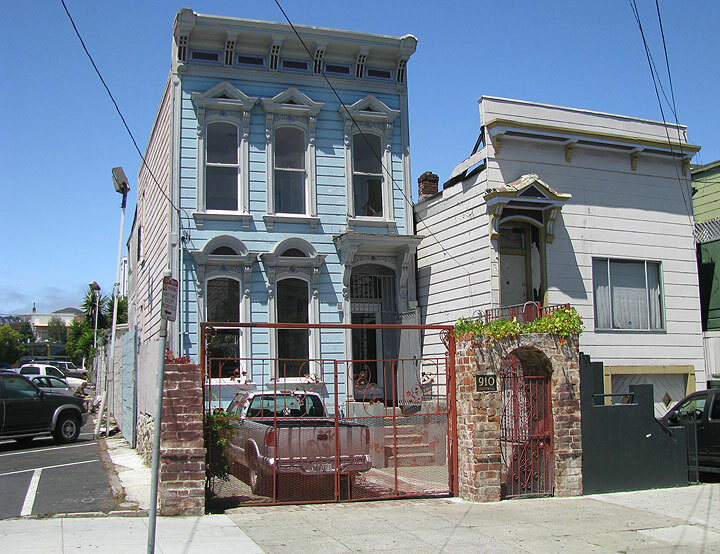 These tiny flat front Italianate cottages on the west side of Shotwell Street between 19th and 20th Streets date to at least 1865. Back then they were occupied by male workers from the Mission Woolen Mills, located a block and a half to the north on Shotwell. The houses are located on the site of the former race track, which changed its name, ownership, and configuration over its 12 years of existence. Opened in 1851 as the Pavilion Race Course, it was re-named the Union Race Course, and by the time it closed in 1863, it was known as the Willows Trotting Course. The angled, pear-shaped race track occupied an off-grid space spanning roughly from what is now the corner of 19th and South Van Ness to 22nd and Harrison streets. Originally, all three houses were likely identical—alterations such as re-cladding in stucco and the removal of what was seen as unfashionable Victoriana ornament was common in the 1920s-1960s. 610 Shotwell Street. 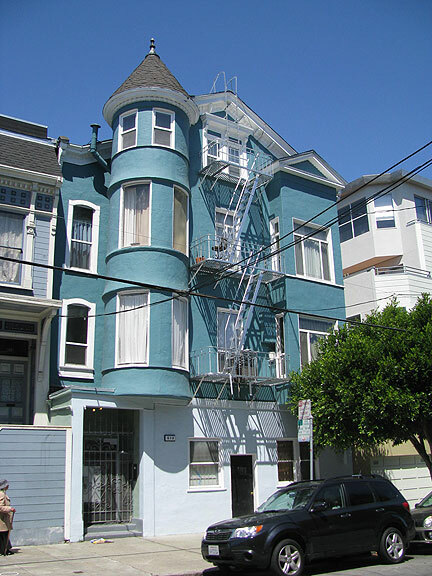 One of the few Queen Anne buildings found on Shotwell Street and an excellent example of alterations—stuccoing, raising, subdividing – common to 19th Century Mission District residential buildings. A few Queen Anne design elements remain: curved window glass set a circular corner bay, a witch’s cap turret, and gabled roofline. Much of the Victoriana trim and gim-crackery, however, was removed and its exterior wood ornament disguised beneath a layer of stucco. Largely hidden, though extensive, were the interior alterations. At some point—possibly in the 1940s, this single-family residence was raised to accommodate ground-level living/work space and subdivided to create eight apartments. A land use map from the 1950s indicate that the ground floor was used as a tamale factory. A second tamale factory was located next door (now demolished) at Shotwell/20th Streets. 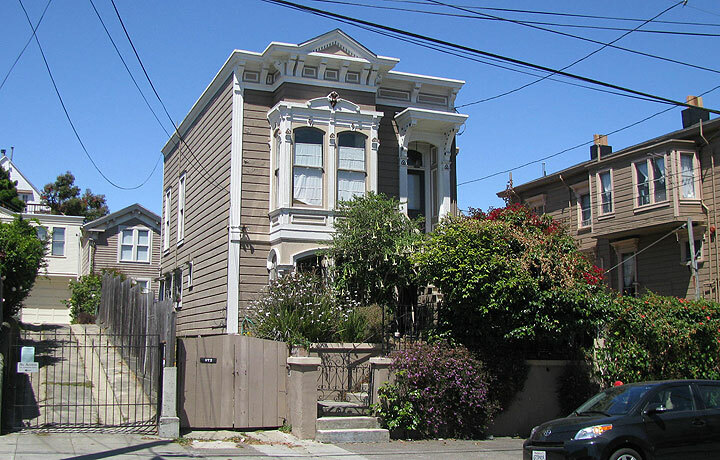 618 Shotwell Street An exuberant example of Stick/Eastlake architecture. Like its neighbor to the north, this building was likewise raised to accommodate an automobile garage and a new stairway reconfigured to access the now heightened entryway. By the 1950s the building had been subdivided into seven apartments (a few of these flats were later reversed). Unlike its neighbor, this building retains its original Eastlake-inspired ornament including pilasters, paneled spandrels, and a sunburst detail within the forward-facing gabled tympanum. Although the general form of the building is common to most Stick/Eastlake row-houses, this particular building reflects the specialized ornament partial to the builder-developer. Unusual detailing is found in the sawn scallop ornament beneath the second story bay window and the double row of raised ornament at the cornice. A cottage is hidden in the rear yard. 634 Shotwell Street. A detached Italianate deeply set back on its lot. 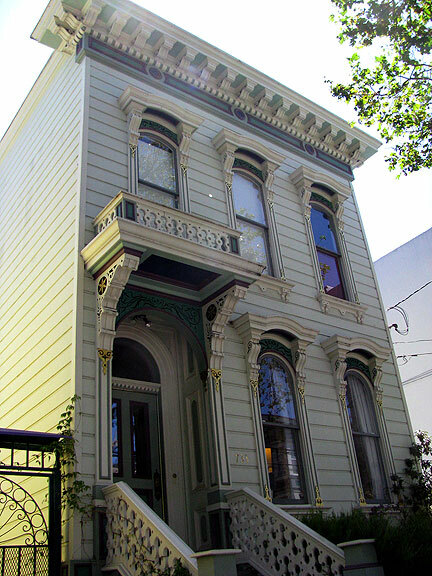 It displays a somewhat rare form and massing for Italianate buildings in the Mission, though a similar example can be found two blocks to the west on Capp Street (the Community Music Center building). The front yard is bounded by cast stone, an early version of simulated masonry. Behind the added central roll-up garage door is an open-air yard and a small cottage studio. 640, 646, 652 Shotwell Street. A row of three Stick/Eastlake detached rowhouses on the west side of Shotwell. These were featured in an iconic c.1900 photograph of a snow-covered Shotwell Street. The building to the right was later re-clad with wood shingles reminiscent of the Shingle Style, a popular style at various times in SF. 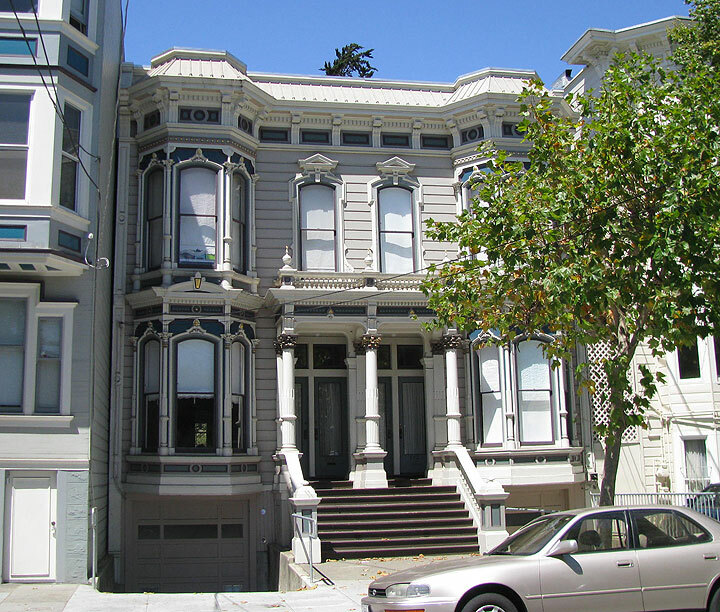 The building to the left sports a faux Mansard roof, a common design feature of buildings inspired by the Second Empire style that emerged in San Francisco during the 1880s. Surprisingly, none of these buildings were altered to make room for an automobile garage, escaping unscathed from the widespread modification of buildings during the 1920s automobile boom. 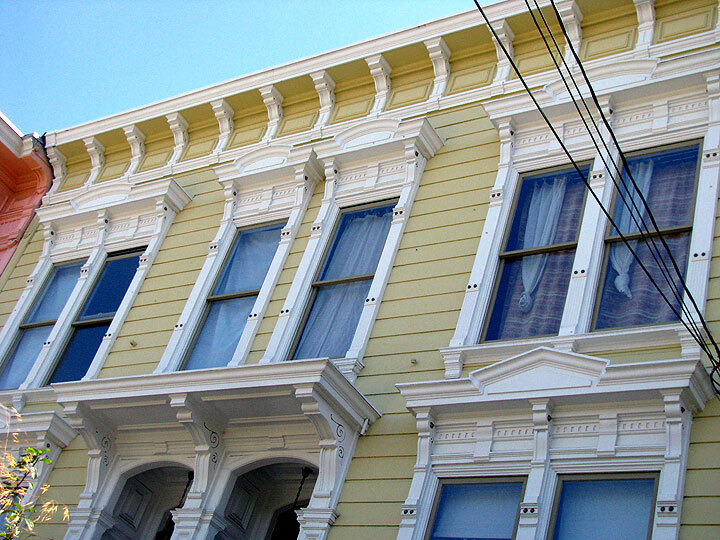 A detailed view of the façade at 661-663 Shotwell Street. The flat front Italianate duplex features design elements reflective of the style including bracketed cornice, incised scroll brackets at the roofline and entryway; tabbed moldings, and paired windows topped with pediments. 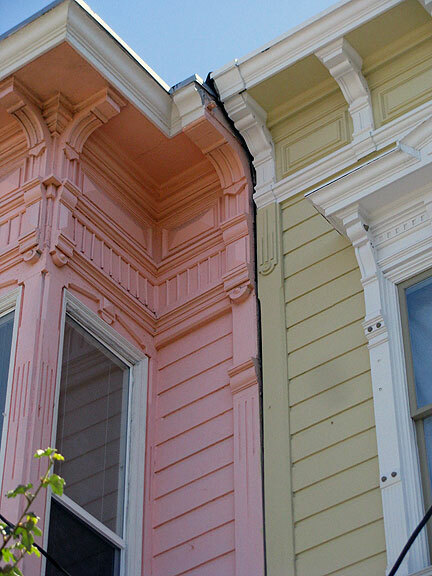 Detail of a pink Stick/Eastlake rowhouse, 651-657 Shotwell Street, and a yellow flat front Italianate rowhouse. Common design elements to both styles include channel drop wood siding, wood window surrounds, paneled friezes and a projecting bracketed cornice. 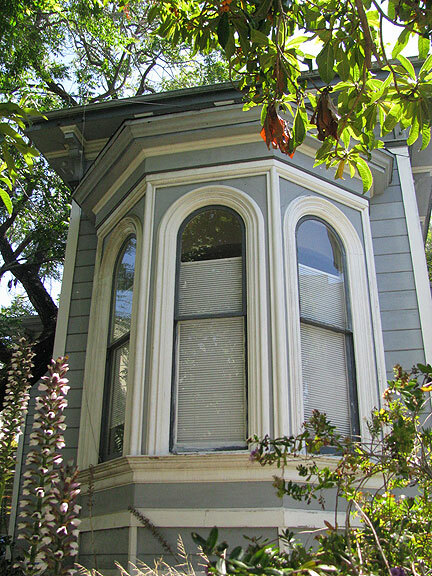 The Stick/Eastlake also features a squared bay window and incised corner boards common of the style. 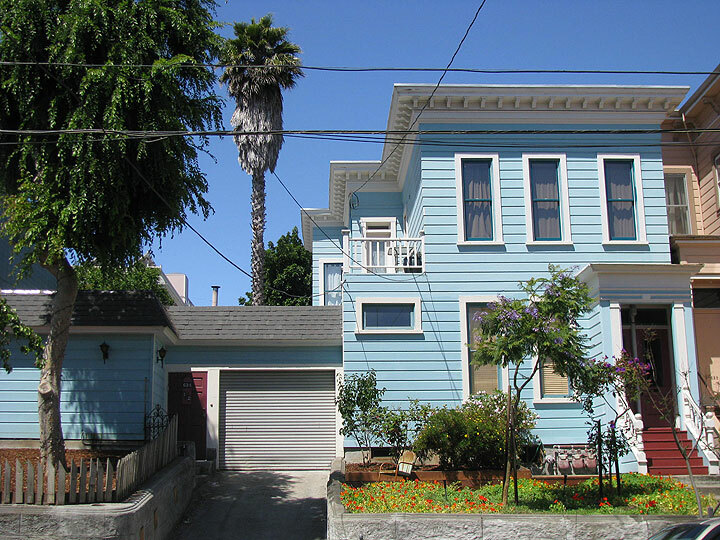 A late detached Stick/Eastlake at 670 Shotwell Street. Visible behind the house is an original carriage house, later converted into a dwelling. 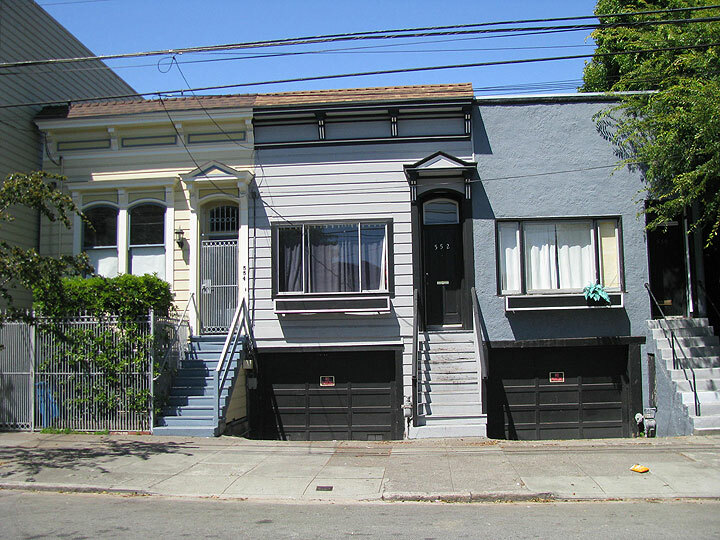 Rear yard cottages are a common feature on Shotwell Street, often hidden behind rows of attached rowhouses. Some of these rear cottages were originally built as stables or carriage houses, others were originally located at the front of the property, fronting the street. 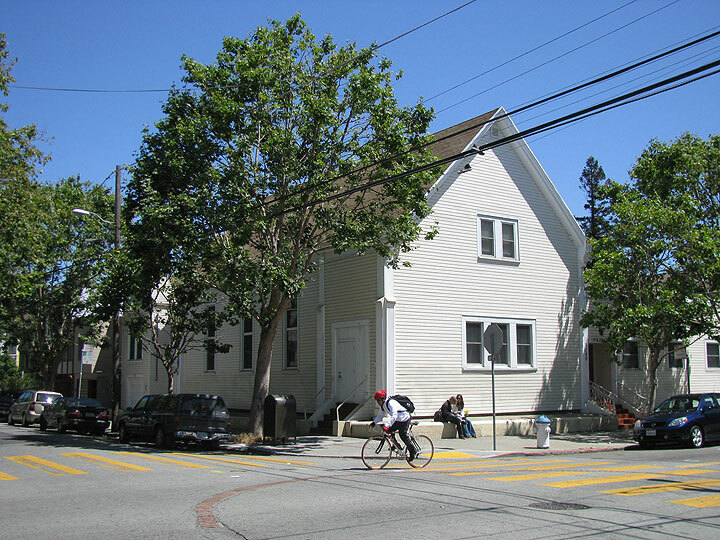 As larger apartments were built on the street—common throughout the Mission District—these smaller cottages were moved to the rear to make room for larger street-fronting properties. 772-774 Shotwell Street An exuberantly ornate example of Italianate architecture. The faux-Mansard roofline links it stylistically to the Second Empire design. Originally built as a duplex, the building was later subdivided into four flats. Notable features include a generous porch, a shared balcony portico, and a prodigious quantity of Victoriana ornamentation. The building is largely intact; however, portions of the front yard were excavated to create steeply sloped driveways to access newly inserted garages. Detail of ornamentation. The building’s architect incorporated nearly all available elements of high-style Italianate design including segmented arch windows flanked by partially fluted colonettes, paneled spandrels, keystones, denticulated intermediate cornices, pediments, dog sawn friezes, pendants, corner boards, and Corinthian columns. 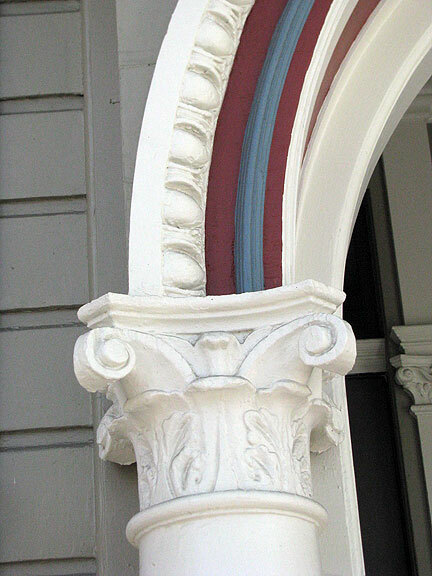 Detail view of the cornice at 3050 22nd Street, a large flats building at the corner of Shotwell and 22nd streets. 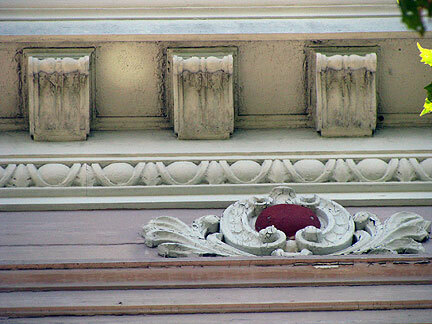 The bracketed cornice featured a cartouche detail at the frieze and a band of egg-and-dart detailing. Egg-and-dart ornamentation is typically found at the cornice of post-1900 Classical Revival flats and are a common interior design—often found on fireplace mantels and cabinetry. Egg-and-dart might look vaguely familiar—the pattern also lines the border of $5 bills! 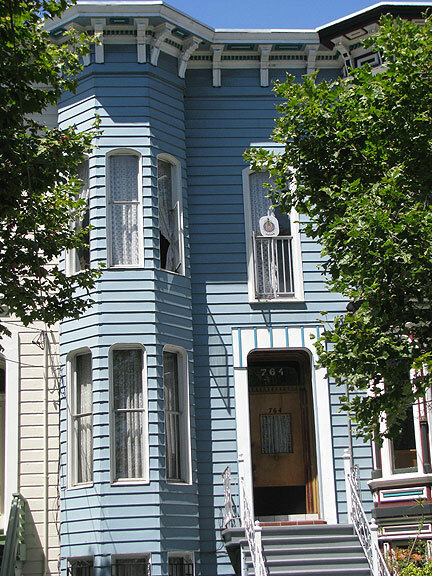 733 Shotwell Street. A classic example of early flat front Italianate residential design. The entry transom and first story windows sport fully arched windows, rather than the far more common segmented arch windows located on the second story. Set back on a large lot, this house was one of a cluster constructed in 1860s and represented on the 1869 United States Coast Survey map. 727 Shotwell Street A rare example of the Greek Revival style design, one of the earliest extant building styles in San Francisco. The forward gable was intended to evoke the pedimented form of ancient Greek temples. 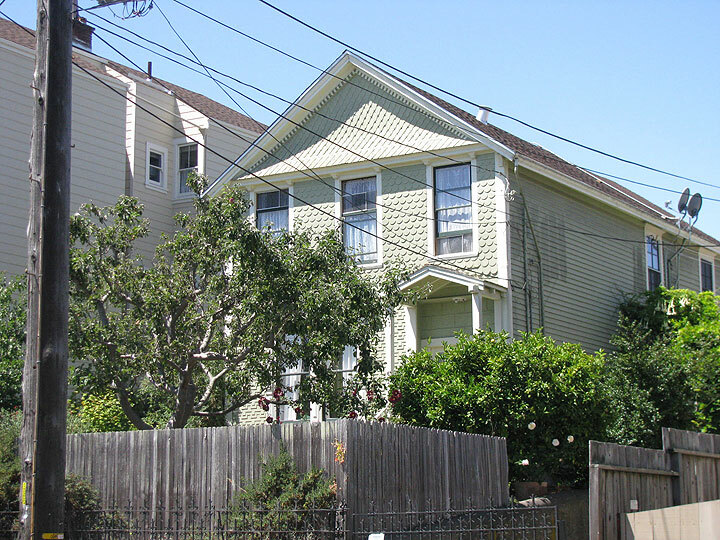 A similar house is located a block away at 858 Shotwell. It’s unclear if the porch is original. Both houses feature two-over-two window pattern, a clue to its early construction date. 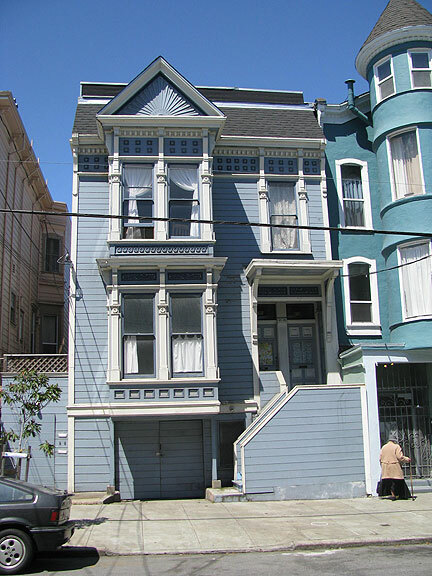 764 Shotwell Street, an example of a highly altered c.1870s Italianate row-house. The original window and entryway ornamentation was removed and the entire building re-clad in what appears to be aluminum siding. Common in the 1950s-1970s, siding made of vinyl, aluminum or asbestos sheets were installed on Victorian-era buildings in an effort to modernize the then-maligned “dust-collectors.” Installation often required the removal of original wood siding and ornamentation, though sometimes the siding is installed atop the original wood cladding. The original cornice escaped largely unscathed. To catch a glimpse at what this façade originally appeared, check out its attached neighbor at 760 Shotwell Street. This row of three attached rowhouses are unusually narrow: the builder likely maximized land by building three attached residences on just two lots. 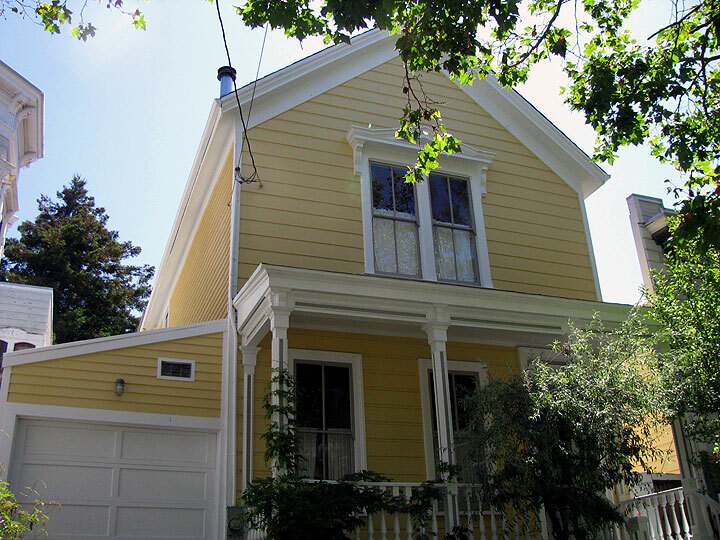 A rare example of a Greek Revival style house, one of only a handful in the Mission District. According to the mounted plaque, it was constructed in 1866 — a likely accurate date given the early development of these central blocks on Shotwell Street. It also appears on the 1869 United States Coast Survey Map. 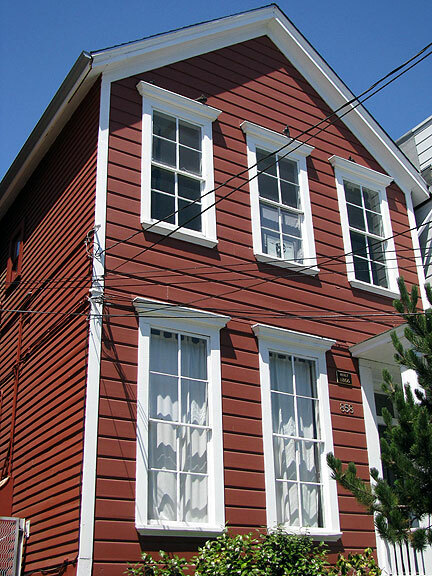 In San Francisco, Greek Revival houses, sometimes referred to as "National Style" are simple wood-frame houses capped with forward-facing gable roofs. Usually clad in rustic wood siding, the largely unadorned houses feature simple lintels and porticos. It appears that this house retains its original windows—very early windows are double-hung divided into four panes on the upper and lower sash. 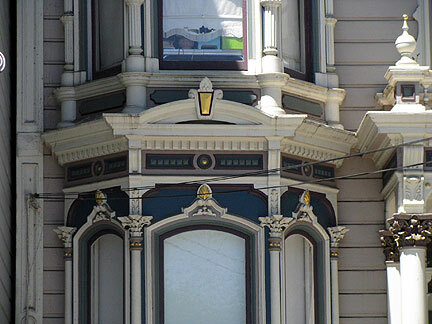 These early windows are extremely rare in San Francisco. The house was subdivided into four flats in the 1920s. 840-844 Shotwell Street. Romeo flats are a unique building type endemic to San Francisco. 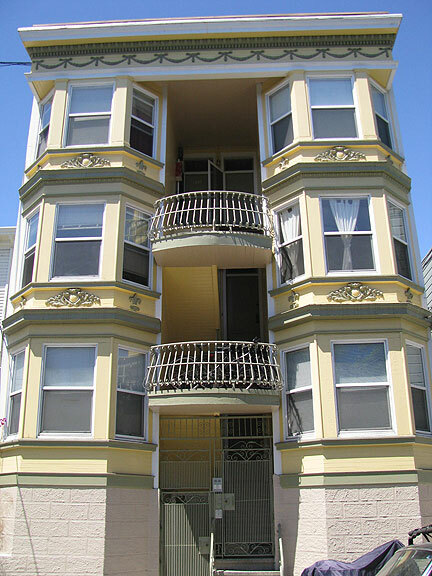 The flats are characterized by a central balcony stairway flanked by full-story bay windows. Romeo flats most commonly contain six units, though four-unit flats are occasionally found. These buildings are associated with the reconstruction of San Francisco following the 1906 earthquake and fire. 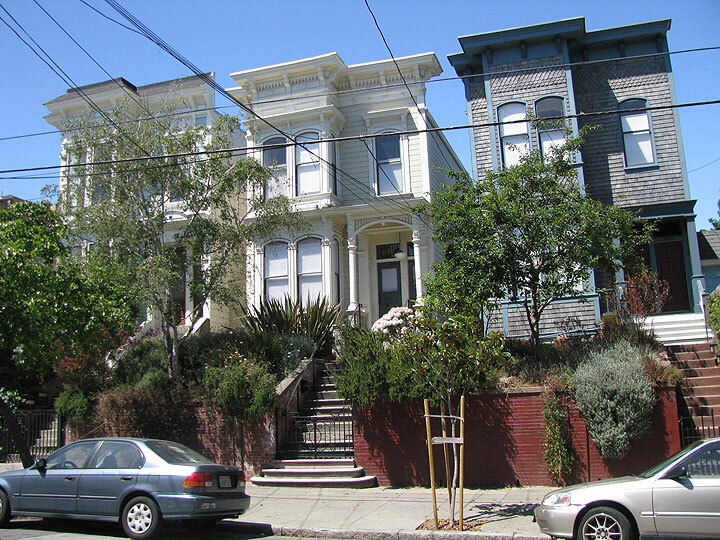 Demands for new housing resulted in the densification of the northern half of the Mission District as destroyed single-family houses were replaced with multi-unit dwellings. Romeo flats generally draw from the Classical Revival design idiom—common features include Classical columns and detailing, projecting denticulated cornices, and heavy block or scroll modillions. 910 Shotwell Street. A lonely flat front Italianate abuts Cala's vast, rarely used sea of parking. 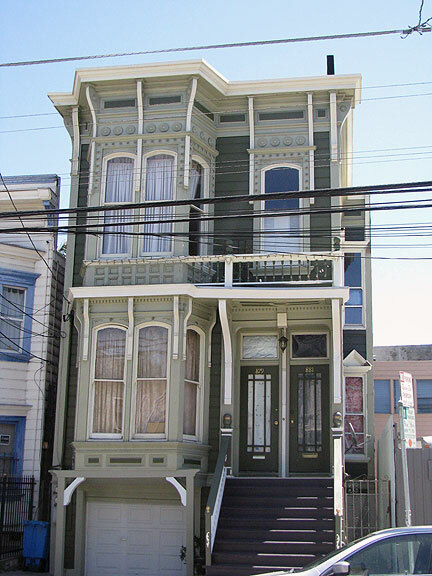 Its doppelganger is located a few blocks away at 733 Shotwell Street. This building likely dates from the late 1860s to early 1870s and retains its original ornamentation. The security bars and gates harkens back to an earlier era of real and/or a perceived lack of safety.